For any given product, listings of autoplays and startupware entries. Windows Update Broke My Computer… not! 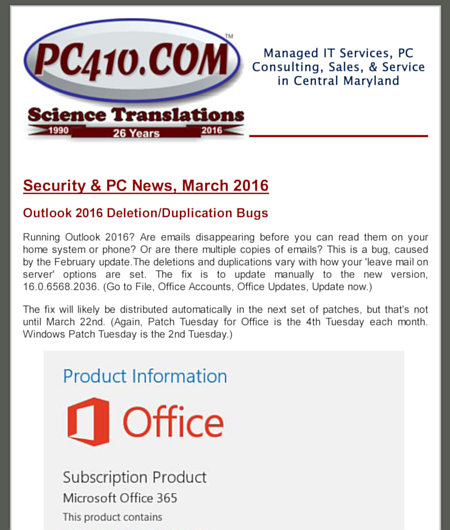 Yesterday was Patch Tuesday. That’s the monthly release date for Microsoft to push out patches for Windows; it’s always on the second Tuesday of the month. Today, I’m getting phone calls about computers being down. “OK, unplug the external hard drive and any other USB storage devices, and reboot.” That fixed it. Why? Because PCs of a certain age, circa 2003-2006, frequently dislike booting with a USB storage device plugged in. The machine is never turned off, until Windows Update comes along and forces a reboot. Answer: LOTS of big patches last night. Slow shutdown was normal; patches were installing. Don’t scare your customers. That’s the job of the bad guys. The Federal Trade Commission has gone to U.S. District Court, and shut down, at least for the moment, Innovative Marketing, Inc. and ByteHosting Internet Services, LLC, who they’ve identified as the source of such nasty-ware as WinFixer, WinAntivirus, DriveCleaner, ErrorSafe, and XP Antivirus. This group of rogue programs has made this past year interesting for me. I clean up these programs more than any other type of malware, and yes, I get paid. But all in all, I’d rather be upgrading hard drives and building new systems. I’ve been getting some very specific complaints about Nero 7 Essentials. “The computer slows down. It crashes. 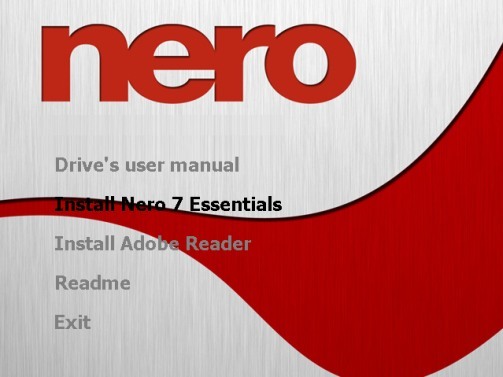 Started with the new DVD writer.” All the drives in question were bundled with the OEM version of Nero 7 Essentials. Time for another test. Test box for today is running an Athlon XP 1900+, Windows 2000 Pro with Service Pack 4, no antivirus or security software whatsoever, lots of memory and drive space, and not much on the hard drive. Before the install, I ran Hijack This and added everything to the ‘ignore’ list, and ran CCleaner, and accepted every registry issue found–it’s a clean test box, so there wasn’t much. 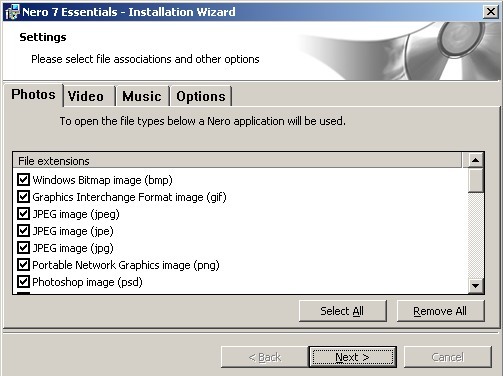 At the truly arrogant file options, I made no changes–Nero wants to be your program for everything related to content. Apparently it’s more than a DVD burning program, in the opinion of the publisher. 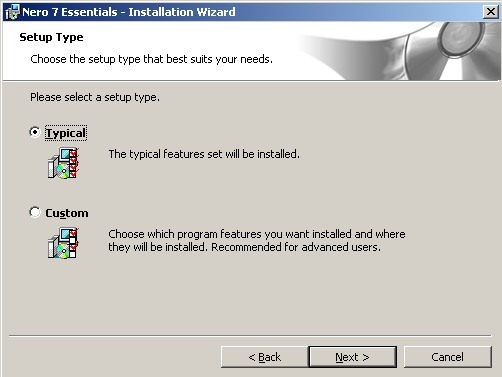 At the install options, I again made no changes. 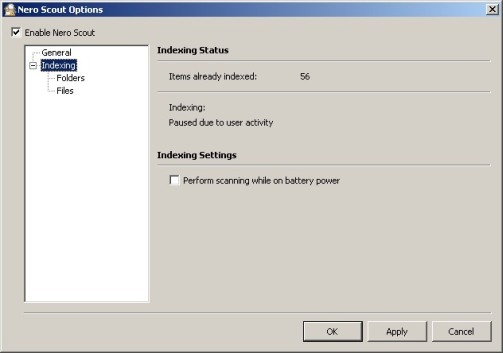 Note the “Nero Scout” item at bottom left, unchecked by default. I won’t comment much on the functionality of the product, except for one item: DVD-video functions (Nero Vision and some other areas) work for 30 days, then display an expired message. OK, I have no problem with a vendor trying to upsell, but announce that the product is half real and half 30-day trial in advance, and give me an option to uninstall the dead software chunks–I don’t need all this clutter. Uninstalled. No error messages. Restarted the PC. Ran HijackThis a third time, and both autostart entries have been removed–good so far. Under C:\Program Files, there’s a leftover folder “Nero” containing 4 files and 2 more folders. Sloppy, but not unusually so. There’s a file left in the c:\WinNT folder, “NeroDigital.ini”. Is it startupware? Absolutely. It adds two autoplay entries, one totally unrelated to the program’s function, doesn’t ask permission before adding the unrelated functions, and turns on a processor-intensive application by silent default. First, don’t install with the defaults. Uncheck every file format on ALL the pages in the install options, except those that you’ll really use the program for. If in doubt, uncheck it. 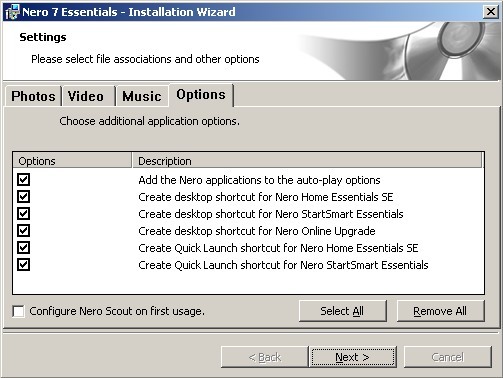 Second, check off that box: “Configure Nero Scout on first usage” and then disable it. And finally, consider some other program. This install doesn’t inspire trust.